The Lambeth Living Well Collaborative Evening Sanctuary launch was a moving occasion for all those who have been on the journey to establish an alternative to A&E for those facing crisis. The Sanctuary was nominated for a Working Together 2016 Lammy Award (NHS Lambeth Clinical Commissioning Group) at a prestigious ceremony at Kia Oval on September 7. The team was one of six nominations in the category that celebrates a team or partnership that has worked effectively or efficiently to deliver clear benefits to the health of Lambeth people. 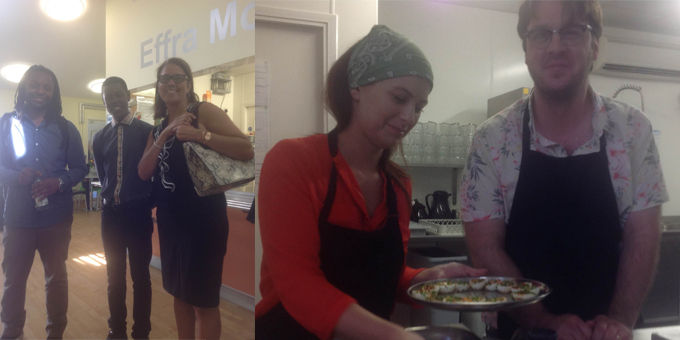 The launch was particularly special for hosts Mosaic Clubhouse whose members were invited to work alongside former Master Chef winner Tim Anderson in preparing the feast for the occasion. Guests were treated to Japanese soul food courtesy of Nanban Japanese restaurant, Sister restaurant to Brixton’s Satay Bar who provided ingredients and the expertise of Tim who is their head chef. Launching the event at the Living Well Partnership HQ, Councillor Jacqui Dyer, (Vice-Chair of NHS England Mental Health Taskforce and Co-Chair of Lambeth’s Black Health and Wellbeing Commission) said the venture was an important alternative to hospital and something she would have welcomed over the years in the experiences of her own family. Denis O’Rourke, Commissioner in Mental Health and Integrated Services thanked those who had been part of the journey, and welcomed how co-production had brought together service users, carers, peer support, the voluntary sector and SLaM (South London & Maudsley NHS Foundation Trust). The vision was to ensure a joined up network for those facing crisis. “The Sanctuary fills a huge gap in the provision of out of hours support for people in mental distress and a great example of the importance of designing and delivering services in collaboration with users of services,” he said. Solidarity in a Crisis peer supporter Garry Ellison who has been working at the Sanctuary since the beginning, along with Mosaic Clubhouse volunteers, reflected on his own lived experience and how he had every faith in Sanctuary success. The Sanctuary has moved from a two-day to five-day service, Wednesday to Sunday, 6pm to 2am. As well as supporting people in a crisis the Sanctuary aims to get people involved in activities and back to life again. Lenka, usually a daytime staff member at Mosaic observes how the same Mosaic principles apply in the Evening. “We listen, we get to know members, we encourage, we share the skills and by working side by side we gradually help them to see how much they are able to do. The most important thing for me is to keep offering. At the same time we learn something new from each other. Damien is pleased with outcomes thus far. “We have had 100 per cent customer satisfaction and average move on score is 6. Since the Sanctuary opened last May, there have been 28 referrals, seeing 18 people attending over 90 evenings.